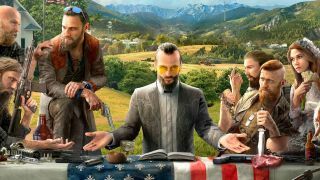 Far Cry 5’s Joseph ‘The Father’ Seed doesn’t fit in with other video game cult leaders. There are no oversized robes and hoods like Resident Evil 4’s Los Iluminados in The Project At Eden’s Gate. You won’t find him bringing about the apocalypse as The Order keep trying in Silent Hill. As far as we know, he’s also not worshiping a giant nuclear bomb like Fallout 3’s The Children of the Atom. Instead, he’s worse. Seed is a charismatic and fearful prophet who is ready to bring salvation to the people of Hope County, whether they like it or not. But more importantly, he has a lot more than just charm at his disposal. When Far Cry 5’s story kicks off, your deputy is along for the ride with a federal marshall and the local sheriff to bring in The Father. Creative director Dan Hay describes Seed’s central belief: “that the world is on the edge and that we're almost not mature enough to realise something's going to happen. And he's going to save as many people as he can.” The only problem is that attempting to take him in is the first of sign of the apocalypse according to, er, him. Triggering a lockdown across the County, you’re now stuck in the area with a group of people who believe the world is coming to an end. Not exactly ideal. So if the idea of a cult taking over a chunk of Montana by force might initially sound far-fetched, you’ll be uneasy to learn that when Hay first took his ideas for the game to founder of the Cult Education Institute, Rick Ross, there was historical precedent for this type of control. One example Ross gives me is the group Rajneeshpuram, who committed the first act of bioterrorism in the United States by poisoning ten different restaurants in Oregon with salmonella, in an attempt to swing a local election in their favour. Far Cry 5's controversial setting is... OMG YOU CAN PET THE DOG! But what are the key signs of a real world cult? Ross explains that are three key signs to a destructive cult. One is an absolute authoritarian and charismatic leader who becomes an object of worship for the group. Another is the “process of coercive persuasion” which helps the leader control his followers. And finally, that the group does harm. Ross defines this as “objectively demonstrated by criminal activity, the physical abuse of members and the pilfering of people's assets.” Watching all these elements find their way into fictitious The Project At Eden’s Gate means that Seed should feel more chillingly plausible than Pagan Min or Vaas ever did. Speaking of these larger-than-life villains, why is an element of realism important to these new antagonists? Because it not only helps shape the MO of The Project at Eden’s Gate, but how you’ll tackle them. Joseph Seed will need a solid organisation underneath him in his quest to “save” Hope County and by his side is the rest of the Seed family: Jacob, John and Faith. Each control their own region in the world map and all have a part to play in Joseph's schemes. Younger brother John, for instance, handles bringing in new members to the cult in Holland Valley, while older brother Jacob focuses on turning cultists into an army capable of defending The Project at Eden’s Gate. Meanwhile, sister Faith is on hand for retention purposes, ensuring that each member has a role to play in the smooth running of the group. So how does this structure affect the action? Well on top of the clear targets it’ll give you when trying to take on the Project, you’ll have to deal with how this people will react to your efforts. Hay talks about heading to John’s region and how your actions will eventually earn his attention. After he teases that you’ll have “a moment” with John, he tells me that the reactive world means that the more you do there, the more focused John is on you. This will see harder challenges thrown your way, until The Father is really taking notice of you. Hay enthuses: “It's powerful to be able to create those layers and have the player be able to snack on them, or jump through them, or go through different tones, or ascend to the end of the game the way they want. If all this sounds incredibly intense for a series that isn’t usually so serious, well this is also game where you can have an AI dog buddy that steal guns for you. Hay knows there’ll be plenty to see and do during your time in Hope County and knows this requires different tones throughout the journey. “We can give you powerful, engaging moments, we can give you moments of humanity, moments of [comedy], moments of all these different things, and it doesn't feel like whiplash as you move from one to the other,” he says. The thing that ties these disparate elements together into making it all believable is casting, with Joseph Seed being brought to life by Canadian actor Greg Bryk (he’s been in a few episodes of The Expanse). While not a recognisable name like Pagan Min’s Troy Baker, Bryk’s audition managed to walk the tightrope of being charming and menacing with Hay succinctly summing up his acting chops: “I said to myself, I would absolutely join that guy's cult. And it took five minutes.” Come February 2018, we’ll have a chance to see just how strong his spell really is.